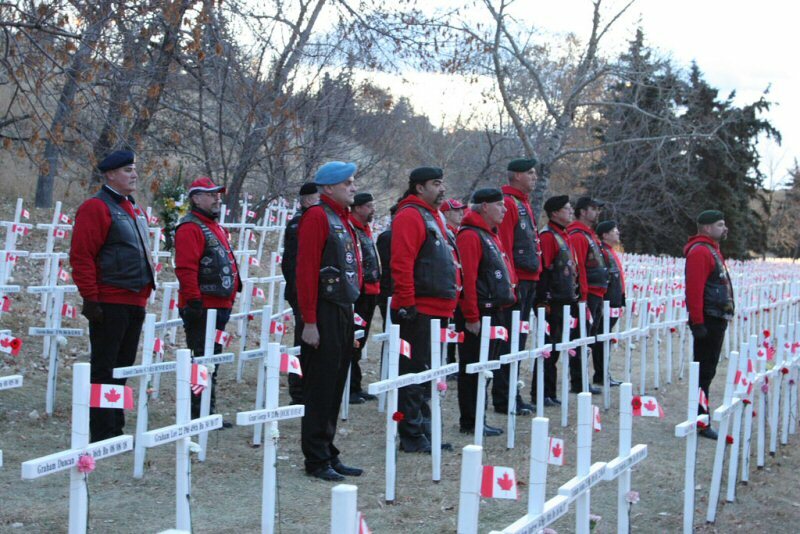 "A yearly tribute to Southern Alberta's fallen soldiers"
Editor's Note: There is a picture associated with this release. Each cross is inscribed with the name, age at death, rank, regiment and date of death of a soldier who lost his or her life in a foreign land fighting for the freedoms we all enjoy today. Members of the public are welcome to visit the site, to walk among the crosses, to lay flowers at a loved one's memorial and to be reminded that the price of our freedom was not free. "It is the soldier, not the preacher, who has given us freedom of religion. It is the soldier, not the campus organizer, who has given us freedom to assemble. It is the soldier, not the lawyer, who has given us the right to a fair trial. It is the soldier, not the politician, who has given us the right to vote." stated Murray McCann; Chairman of the Field of Crosses Memorial Project. Since 2009 the Field of Crosses Memorial Project has been taking place on Memorial Drive NW between 3rd Street NW and Centre Street, in Calgary; Alberta. This year the project will be missing George Bittman who spearheaded it on behalf of The McCann Family Foundation and the Calgary Poppy Fund. Mr. Bittman passed away suddenly, last December, shortly after completing the 2011 program. "We miss our Dad/Grandpa dearly, and as this project was one of his true passions, we are honored to lend our support and participation in continuing this Remembrance Day tradition." stated Laura Vanderkruk daughter of the late George Bittman and Volunteer Director for the Field of Crosses Memorial Project. It is estimated that more than 3,000 Southern Alberta men and women have been killed while serving in the Canadian military in combat or peace keeping missions. The number of crosses has increased each year as more research identifies more names. The annual display is a visual reminder of the large number of local soldiers who gave up all their tomorrows so that we can have ours. "The Field of Crosses Memorial Project holds a special place in my heart, as my son was killed in Afghanistan in 2007, and this is a way our family can pay tribute to him and the thousands of others that served the ultimate sacrifice." stated Michael Hornburg, father of Nathan Hornburg who was killed during operations in Afghanistan. Each dawn starting November 1st to November 11; a special ceremony will take place at the Field of Crosses Memorial Project. With each ceremony there will be National, Provincial and local dignitaries on hand to lend their support towards the project and to honor those who lost their lives defending our freedoms. Further information on the Field of Crosses Project can be found at www.fieldofcrosses.com.